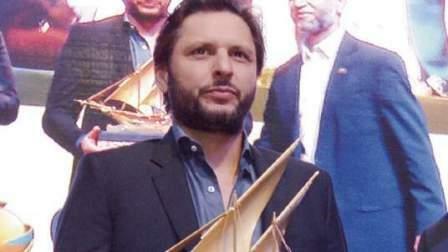 Legendary Pakistani cricketer Shahid Afridi has endorsed the Dubai Fitness Challenge initiated by His Highness Shaikh Hamdan bin Mohammed bin Rashid Al Maktoum, Crown Prince of Dubai, at Pakistan Association Dubai on Friday evening by volunteering to raise 1,000 bricks for the health and fitness centre at the association. Speaking at the own a brick campaign titled "A Journey Towards Shahid Afridi Foundation Health and Fitness Centre" - where his foundation, the Shahid Afridi Foundation volunteered to raise 1,000 bricks for the Health and Fitness Centre - he encouraged members of the community to ensure effective physical exercise to remain active and have a healthy immune system. The event was attended by over 350 people. The former captain of the Pakistan cricket team also gave away two fitness watches to those who registered themselves first under PAD. The Pakistani community has taken a lead role in #Dxb30x30 by distributing 100 fitness watches among its people who register first under the banner of PAD. This was a second collaborated event by the Shahid Afridi Foundation and PAD to raise awareness for the world's largest community centre for overseas Pakistanis. "I am proud to be part of this landmark project and I extend my full support even after completion of 1,000 bricks," said Afridi. He also added that people should always come forward and contribute towards community projects. "I'm also pleased that my foundation is performing tremendously in the rural areas of Pakistan serving the marginalized community with full sincerity and dedication" said the veteran all-rounder. Dr Faisel Ikram, President of PAD said, "Afridi is a legend and has translated his fame into social work and community service leaving a legacy for his followers to learn from". He praised the vision of the leaders of Dubai by leading the citizens from the forefront and engaging them in physical and social activities. "Pakistan Centre will place the Pakistani community on the top in the UAE," added Dr Ikram. The highlight of the event was a bat, shirt and a ball signed by Afridi whilst the bat fetching 61 bricks, the shirt and the ball fetched 20 bricks and five bricks, respectively. The thrilling moment was when Afridi called in people from each table to join for group photos on the stage. The 37-year-old international cricketer has a huge fan base among all demographics of the Pakistani community. The Shahid Afridi Foundation signed an MoU with PAD on February 27 this year pledging support by 1,000 bricks for the Health and Fitness Centre which would be named after the legend's foundation. Once ready, the fitness centre will also serve as a rehab facility for the patients visiting the Pakistan Medical Centre, also a component of Pakistan Centre. Launched last year on August 14 with a campaign of Own A Brick, Pakistan Centre was commemorated under the theme of One Nation One Dream bringing the entire Pakistani community under one roof. The construction cost of the project is Dh12 million (12,000 bricks = each brick is Dh1,000) and one year after announcing the project Dh8 million has been received and pledged. The mood at the Pakistan Auditorium was further enhanced by renowned stand-up comedian Salman Qureshi and his troupe by engaging the audience in a tongue in cheek comedy session.